With invention of crypto back in 2008-09, there have been a lot of specs around cryptocurrencies like Bitcoin, Ethereum etc. But suddenly in 2017, Bitcoin rose to $10’000 a coin! This gathered everyone’s attention towards cryptocurrency market, that was secretly making people millionaires and billionaires. 2017 and 2018 might be two years that saw maximum number of new users entering the cryptocurrency domain and most of them were young millennials who were passionate to try their hand in the digital currencies. While Bitcoin and Ethereum might be popular cryptocurrencies, still a lot of people are unfamiliar with a concept of mining a Bitcoin. Mining is not the manual or traditional ore mining, where miners drill hole into the Earth to excavate precious metals. But in this case, mining refers to solving complex problems using a computer’s computational power, to be rewarded by crypto like Bitcoin later. With increasing number of miners in the market and requirement of heavy computational power, Bitcoin mining is only limited to big mining farms that use thousands of computers and maintain them to mine cryptocurrencies. Users can transfer crypto-assets from one wallet to another. The wallet addresses are complex and hard to memorize, because of the combination of numbers and alphabets. It is like a default password that gets assigned to you when you sign-up for a new social media account. This Terraminer review focuses on clearing the doubts users have, about this coin and operations of the company. It is mining hardware manufacturer and, also a mining farm that allows and welcomes all users to invest in it using traditional money. In turn, they will mine cryptocurrencies for their users and the users do not need to purchase the heavy equipment or spend on hardware, but they can just spend some money online to be members of one of the largest mining farms of the world! They have manufactured hardware that help solve the problem of delayed transactions in cryptocurrency. Whenever a sender sends an amount to the receiver, it gets verified and cross-checked. Only after a proper verification does the receiver gets the amount. A Visa or MasterCard performs millions of transactions in an hour, which makes them stable, reliable and fast methods of payment. While, when it comes to cryptocurrencies the transactions are not only delayed, but entire method is painstakingly slow. They aim to improve this delay, and perform quick transactions in cryptocurrencies, so that the users/customers do not have to spend time on waiting for their transaction to get cleared. After all, who would like to wait for thirty minutes at a coffee-shop just to clear the bill after having a coffee? This underlying problem is a serious issue that poses the threat to scalability of cryptocurrency. Traditional currency enthusiasts, bankers and economists, still believe that cryptocurrency can never replace ongoing fiat currency, and that cryptocurrency is nothing but a fad that will end very soon. But seeing a potential that cryptocurrency holds, it cannot be called a fad or a short-term trend, but it is there to last for a lifetime instead! How does Terraminer Online Work? They manufactures Terraminer 4 Bitcoin Miner and allows users to invest in their project. They will mine cryptocurrencies and they will not focus on any one crypto-asset. But they will mine whichever cryptocurrency they can, on the desired hash-rate to derive maximum profits from their available resources. In turn, they will reward their users with their in-house token called TRM, which is an Ethereum based ERC-20 token. The investments made by users will be utilized to either purchase new and faster hardware to mine more coins, or to bear other technical expenses. They have provided a thorough and complete guide to help users understand the entire process. This Terraminer ICO review aims to provide in-depth information about the coin. Terraminer online price is price of their ICO/token. The token began in December 2017 for sale. In the pre-ICO sale it was priced at $4.5 per coin, while in ICO sale, it was priced at $5.5 and after April 2018 (post ICO sale), it will be at $6.5 per coin. Many users are right to have a question in their mind – is Terraminer legit? It has trust of a lot of big investors and cryptocurrency enthusiasts. Unlike many other ICOs that turn out to be a calculated scam, terraminer is here to stay. Users who bought the pre-ICO coin at $4.5 can now sell at $6.5 making instant gain. Profit calculator says that it is a reliable, legitimate and solid crypto-mining farm. Their white paper lists out various features of Terraminer. You can buy the ICO any time from their official website. Setup in Bulgaria and China, Terraminer provides a lot of services to their users. By allowing them to invest in their project, they are spending that investment on hardware components, more mining equipment, cooling equipment and mobile mining. They are also focused to scale their operations and to retrieve cheap electricity to derive higher profits. The payback period for the customers is short, so that the funds are not stuck for a long time. They also aim to scale their operations and improve the transaction time for the cryptocurrencies. The biggest problem right now, in the cryptocurrency market is the transaction verification period. It takes a long time for a transaction to get verified and reach a receiver from a sender. Terraminer aims to solve that problem by their cutting-edge technology and state of art system. 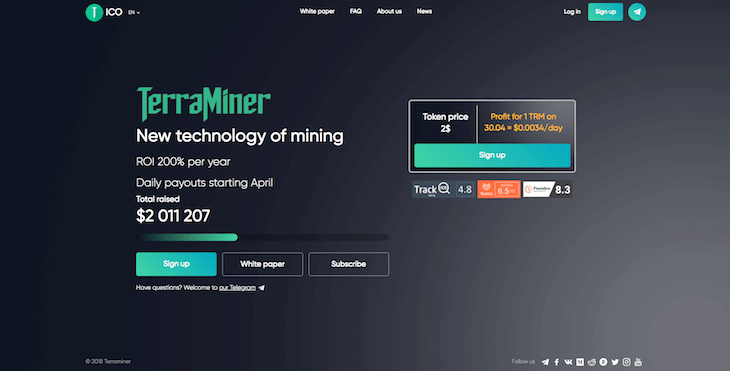 Cointerra Terraminer IV is the hardware or cryptocurrency miner that is used by Terraminer to mine bitcoins, Ethereum and other profitable crypto-assets. It can also be purchased by interested customers, but it is better to invest in Terraminer directly and garner the profits by letting the organization do the hard-work. Terraminer produces and manufactures high-end and innovative ASIC processors to solve transaction issues in cryptocurrencies like Bitcoin. 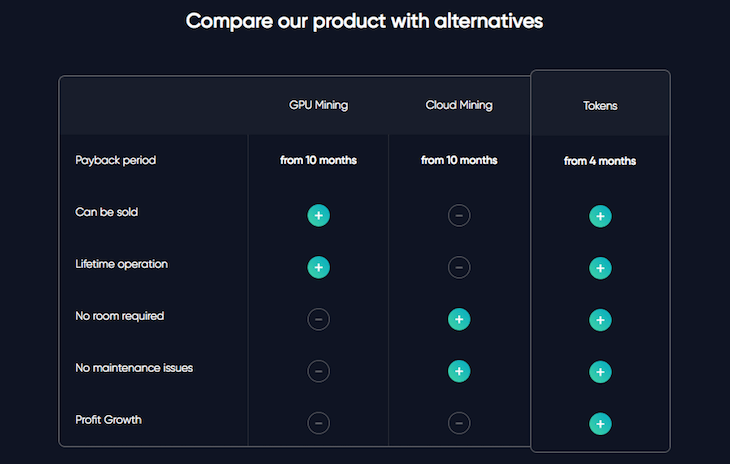 They aim at providing quick results and deliver Bitcoin mining solutions with highest performance.